Home Pets These Pets Are The Proudest Parents Ever! Ah, the miracle of life! It’s exhausting giving birth to, feeding, and nurturing a bunch of helpless little pipsqueaks, but these pet parents are taking it like champs! Proud of their babies, and proud of themselves! This bulldog dad is eager to let everyone meet his baby. 2Group photos are a bit challenging with 5 kids. These cat parents decide it’s best to let their kids be themselves. 3We’re so excited to be parents! If they have opposable thumbs, they’d be vlogging about every single milestone their kids achieve. 4This mama is ready to fight if anyone dares touch her babies. The death stare of a parent who’ll do anything to protect their little ones. A happy mama is a radiant mama. 6Being a mum is exhausting. But as long as your babies grow up well, it’s all worth it. Her little family will always spark joy in her heart! What would you name these seven kittens? 9Grinning from ear to ear! A proud golden retriever mum and her little ‘golden nuggets’! 10Watching over her little ones. You’ll have to grow up someday, but for now, let me watch over you. 11Looking a little frazzled there! For real, parenting leaves you with so little time to yourself, but I won’t have it any other way! Your parents are here for you, no matter what happens. This calls for a lovely group selfie! Oh sweetie, you’re growing up so fast! Mama’s gonna miss you being so little! Mama Wrinkle’s even laid out a red carpet for her baby wrinkles! Have you witnessed proud parent moments from your pets? Tell us all about it in the comments section! 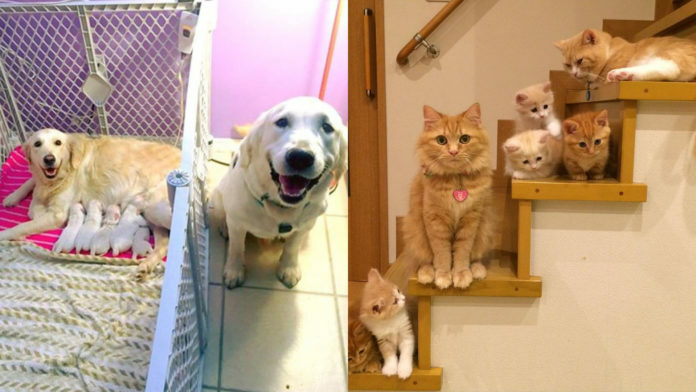 We’ve got more adorableness lined up for you in our Pets category – check it out! Subscribe to our YouTube channel to get dibs on our latest videos! Stay updated with us on our social media! Previous articleChristmas 2017: Sweet Treats You Can’t Miss This Festive Season! Next article18 Cats Who Are Silently Judging You.